Boulder County, Colo. - The Thirtieth Annual Multicultural Awards Banquet, which takes place Oct. 4 at the Jewish Community Center in Boulder, celebrates people of color who have made significant contributions to the community. 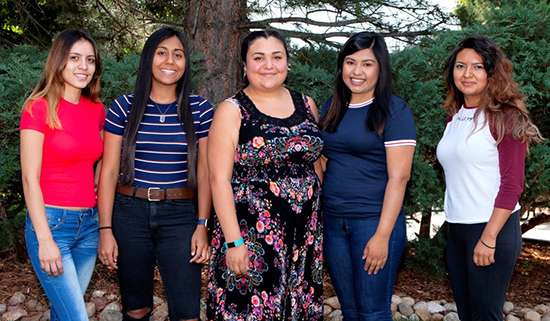 One goal of the banquet, hosted by Boulder County Community Action Programs, is to provide scholarship monies for area multi-ethnic students with low-income to help make the goal of a college degree more attainable. Tuition costs continue to rise, and scholarship availability, especially at public institutions, can be very competitive. Five of the scholarship recipients attended an awards ceremony on Aug. 15. Pictured from left to right are Dulce Valle, Veronica Ramirez, Johana Campos, Esmeralda Rosa De Mendez, Marisol Reyes Escobar.